Home » News » Easter egg eggstravaganza! 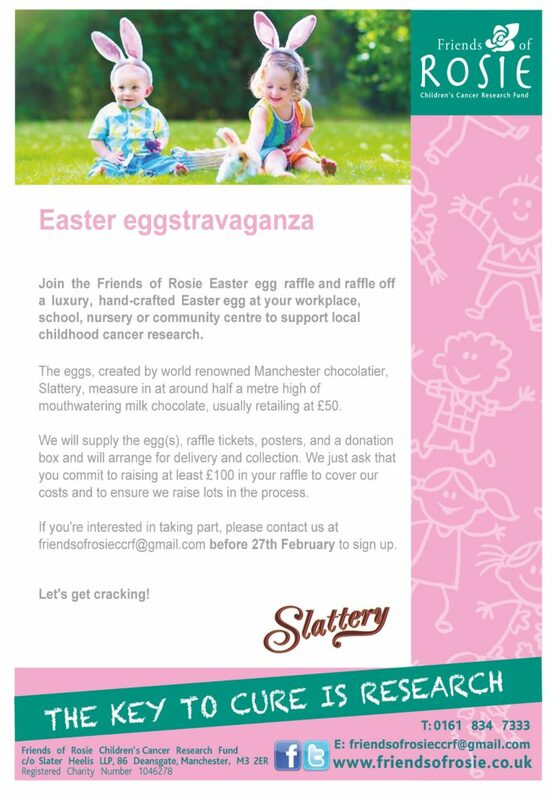 Join the Friends of Rosie Easter egg raffle and raffle off a luxury, hand-crafted Easter egg at your workplace, school, nursery or community centre to support local childhood cancer research. mouthwatering milk chocolate, usually retailing at £50. We will supply the egg(s), raffle tickets, posters, and a donation box and will arrange for delivery and collection. We just ask that you commit to raising at least £100 in your raffle to cover our costs and to ensure we raise lots in the process. If you’re interested in taking part, please contact us at friendsofrosieccrf@gmail.com before 1st March to sign up.